In order to understand our beloved guinea pigs a bit more, its interesting to find out a bit more about where they come from and their more wilder cousins that live in the Andes region of South America. There are many different species of guinea pig that live in the wild, and one such species is the Montane guinea pig that inhabits this region and lives in the wild. So here is a brief introduction to the montane guinea pig, well ok, all the information I could find. So for this blog post I am in-debited to the following sources. Go there for some really in-depth information on wild cavies in the Andes region. Here are 10 facts to introduce the Montane guinea pig and help you become more acquainted with it. 1. 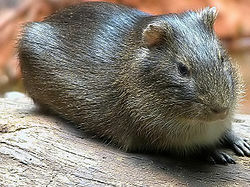 The montane guinea pig is species of guinea pig that is found in Peru, South America. Its binomial name is cavia tschudii. 2. It is a wild guinea pig and lives in peru but is also found in the highlands of Bolivia, north west Argentina and north east Chile. 3. The montane guinea pig enjoys habitats that are most and that are close to riparian habitats. They enjoy thick grass and grasslands that are full of brush where they can make tunnels and runways. They also enjoy rocky areas, forest edges, swamps and savannah’s. 5. As with other guinea pig species, they enjoy living in groups of up to 10 cavies as natural herd animals and use each other to keep themselves safe against predators such as llamas, alpacas, vicuñas and guanacos not to mention Darwin’s Rhea and the Andean Condor. 6. Their colour tends to be a grey or brown colouring and is a lot less distinctive than breeds of domestic cavy. 7. They are most active during the night time as opposed to during the day when they can move around in less danger of unwanted attention from predators. 8. They enjoy making burrows that have lots of different entrances. This enables them to get from place to place with ease. They also use burrows made by rats and mice and other burrowing mammals so do not just make them themselves. 9. They have a gestation period of 63 days. The will mate throughout the year and do not discriminate due to the season. 10. The enjoy foraging for plant materials in the area that they live. These can vary widely in variety, but they will seek out what they need to survive.